Rexel Superfine A5 pockets are made of lightweight polypropylene, allowing for clear photocopying and ideal for use on an OHP. 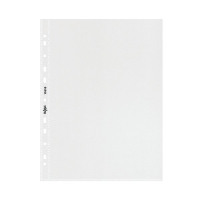 Waterproof, wipe clean and print safe, the pockets feature a clear reinforcing strip with multi-punched holes to fit most ring binders and are lightly embossed to reduce glare. They come in packs of 20 and have a top opening that allows easy access to contents when placed in a ring binder.